31 Oct The Early Bird is Back! Hey there, sunshine! It’s a beautiful day here at OGHQ. The leaves are turning, the birds are chirping, the worms are wriggling, and our early bird applications are trickling in. One lucky birdy is going to catch more than just a worm – they’ll get the trip of a lifetime! What are we going on about? Early Bird Catches the Trip, of course! 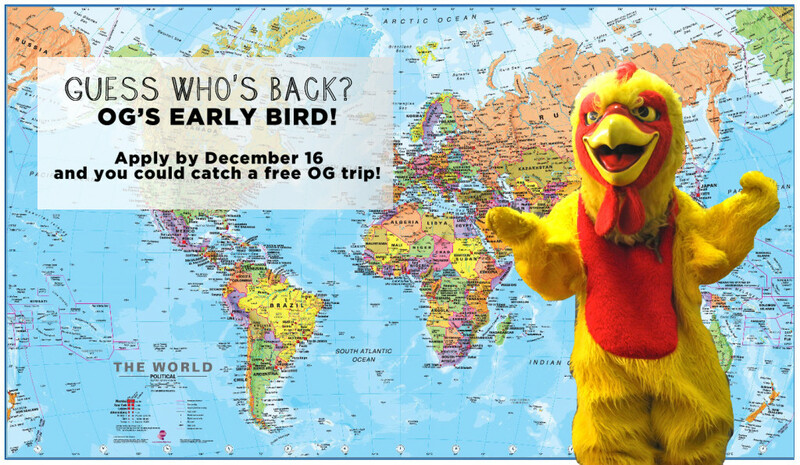 Future backpacktivists who apply before our early bird deadline on December 16 are automagically entered in a raffle to win a free trip with OG. So be an early bird for a chance to catch the trip and enjoy an amazing experience on our dime. It’s just that easy! The winner will be notified and announced on December 17. Now all you gotta do is tell us where you wanna go next summer! Check out our map of where we go and apply today! ** Hold up! Let us cover our bases: Only those applying for our summer programs are eligible to catch the trip. Prize only covers the program fee and does not include your flights, community contribution, travel insurance, and personal expenses (such as gifts, souvenirs, independent travel time, etc. ).